Alydar winner Realm will make his graded stakes return as part of a field of seven in Saturday's Grade 2, $300,000 Kelso Handicap for 3-year-olds and up at a mile at Belmont Park in Elmont, N.Y.
Carded as Race 8 with a scheduled post time of 5:18 p.m. ET, the 38th running of the Kelso tops a 10-race program on Saturday with live coverage on Belmont Park Live from 4-6 p.m. on MSG+. Trainer Barclay Tagg said he hopes to start Realm on Saturday with a long-term eye on the Grade 1, $750,000 Cigar Mile Handicap, a race the veteran conditioner won in 2008 with Tale of Ekati and 2010 with Jersey Town. Realm, a 5-year-old Virginia-bred gelding by Haynesfield, will enter the Kelso on a pair of wins this summer, having run down Papa Shot in a 1 1/16-mile optional claiming race on June 29 at Belmont before taking the restricted 1 1/8-mile Alydar by a hard-fought head around two turns on August 5 at Saratoga Race Course. Realm, owned by Eric Dattner, Tagg, and Harry Astarita, was third as a 3-year-old in the 2016 Cigar Mile behind Connect and Divining Rod. He hit the board in two Grade 3s that winter before finishing a well beaten fifth in the Grade 3 Westchester in May of 2017. Junior Alvarado, who has been aboard for Realm's last three starts, has the return call. The pair will break from post 3 carrying 116 pounds. Lael Stable's No Dozing will stretch back out to a mile following his fifth-place finish in the seven-furlong Grade 1 Forego on August 25 at Saratoga. Prior to the Forego, the Union Rags gelding made his late 4-year-old debut on July 21, winning a seven-furlong optional claimer by three-quarters of a length in near-record time at the Spa. “I think he'll be more efficient with a one-turn mile compared to seven-eighths. I'm much more comfortable going a mile with him, especially at Belmont,” said trainer Arnaud Delacour. “Everything depends on what kind of post position we have and how he breaks. He tends to break a step slow from time to time. David Cohen picks up the mount and will ride No Dozing from post 4 at 116 pounds. Don Alberto Stable and WinStar Farm's Battle of Midway has been installed as the field's high weight with 123 pounds. 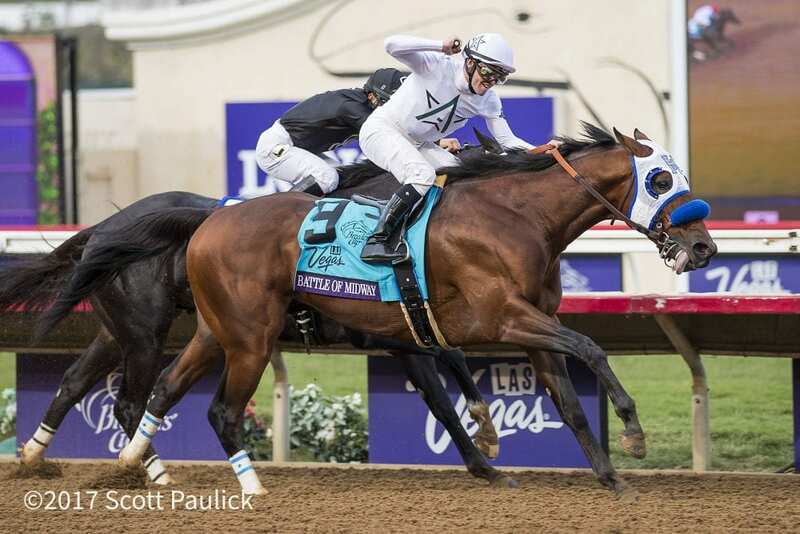 Trained by Hall of Famer Jerry Hollendorfer, last year's Breeders' Cup Dirt Mile winner will be making his second start following his return to racing in 2018 after being found subfertile in the breeding shed. Battle of Midway, a 4-year-old colt by Smart Strike, stumbled at the start of his season opener but regrouped well enough to finish second in the Grade 2 Pat O'Brien, crossing the wire 7 ¼ lengths behind Catalina Cruiser. Battle of Midway will be ridden by Flavien Prat from the rail. Trainer Chad Brown will be represented by a pair of runners in Timeline (118 pounds), fourth in the Alydar last time out, and Patternrecognition (115), making his stakes debut following a three-quarter-length win in an optional claiming race August 11 at Saratoga. Dennis Drazin's homebred Sunny Ridge (118), cross-entered in the PA Derby Champions on Saturday at Parx Racing, could cut back around one turn after finishing ninth in the Grade 1 Woodward on September 1 for trainer Jason Servis. Still Having Fun (116), himself cross-entered in the Grade 3 Gallant Bob Saturday at Parx, is the lone 3-year-old entrant in this year's Kelso. This entry was posted in NL List, Racing and tagged arnaud delacour, Barclay Tagg, battle of midway, belmont park, Horse Racing, kelso handicap, no dozing, realm by Press Release. Bookmark the permalink.